Commencement ceremonies are scheduled Saturday for San Diego State University, San Diego Mesa College and the University of San Diego School of Law, but were postponed at California State University San Marcos because of the Cocos Fire. Mesa College will celebrate its 50th graduating class. Nearly 1,400 students are set to receive academic degrees and certificates, of whom 49 achieved a 4.0 grade-point average, according to the school. Former Marine Sgt. Thomas Bloom, who will receive associate’s degrees in mathematics, physics, and liberal arts and sciences, will be the student speaker. Bloom has been active in student affairs and is co-founder of the campus resource center for veterans. Sarah Farmer, a Poway resident who battles a nerve system syndrome and bipolar disorder, will be a student honoree. The psychology major is one of 20 selected nationwide to the All-USA Community College Academic Team. San Diego Latino activists Carlos and Linda LeGerrette will be honored as distinguished alumni. The ceremony is set for 4 p.m. at the University of San Diego’s Jenny Craig Pavilion. Commencement will continue at San Diego State University, where the colleges of business administration, arts and letters, and engineering will hold graduation ceremonies beginning at 8 a.m. in Viejas Arena. 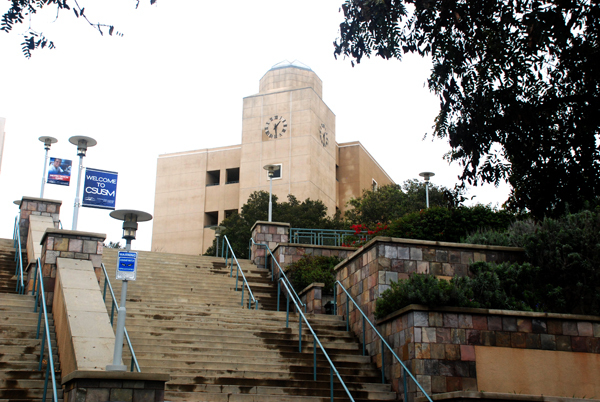 The University of San Diego School of Law will hold graduation on campus beginning at 9 a.m.
Commencement at Cal State San Marcos was postponed until next weekend because of a wildfire that burned the hills behind campus and caused the school to be evacuated.